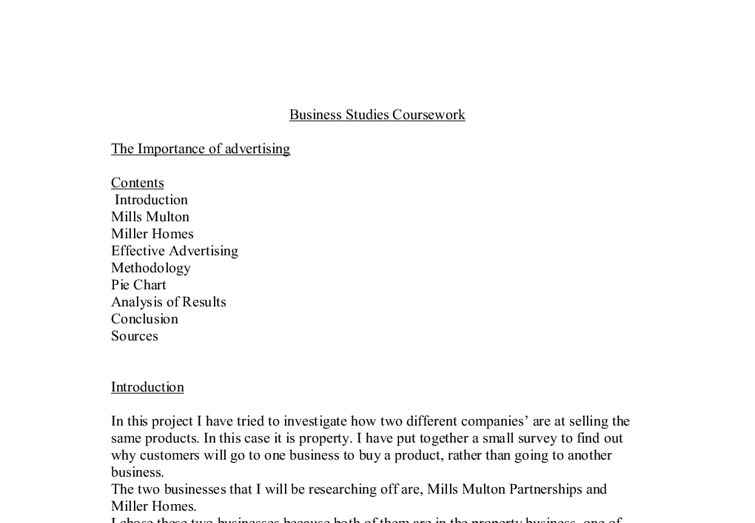 Business Studies Coursework The Importance of advertising Contents Introduction Mills Multon Miller Homes Effective Advertising Methodology Pie Chart Analysis of Results Conclusion Sources Introduction In this project I have tried to investigate how two different companies' are at selling the same products. In this case it is property. I have put together a small survey to find out why customers will go to one business to buy a product, rather than going to another business. The two businesses that I will be researching off are, Mills Multon Partnerships and Miller Homes. 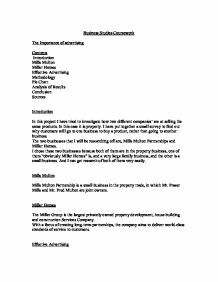 I chose these two businesses because both of them are in the property business, one of them "obviously Miller Homes" is, and a very large family business, and the other is a small business. And I can get research of both of them very easily. Mills Multon Mills Multon Partnership is a small business in the property trade, in which Mr. ...read more. I asked Mr. Fraser Mills "If Miller Homes can afford to spend more money on advertising, and gather in more customers than other businesses wont it affect the amount of sales for Mills Multon? Mr. Mills replied, " If Miller Homes or any other business have more money, then we have to present our properties with better quality". A company will spend a lot of money each year on marketing. A good marketing programme will have a number of strands, which together make up the marketing mix. The marketing mix is a combination of a product, price, promotion and place. Promotion includes all kinds of advertising, free gifts and other incentives to make customers want to buy the product. There are very important reasons for spending so much on marketing. The main reason is to make the company competitive so that it will do better than its rivals. ...read more. As with most other Property companies they advertise in the "Property Section" in the newspaper, this gives people the chance to take there time and decide on property's. They also advertise in things such as Radio, and for the Richer, larger companies, Television. Mills Multon on the other hand, seams to advertise in the "Other Category" By sponsoring local teams such as the "Edinburgh squash club." Aswell as Miller Homes they also have "Logos" (Advertising Boards) and post them outside properties that has been built and, is being built. Mills Multon also uses the newspapers, the radio but unfortunately not the Television. Conclusion I have concluded from this research that... Sources I had got my research through Mr. Mills and Mr. Miller by interviews and E-mailing, I put together a small survey, and handed them out to my friends and to the public. I used Edinburgh maps from the school library, and used the Internet for small pieces of information. ...read more. This control includes the: * Press - national and regional magazines and newspapers. * Out door advertising- posters, transport and aerial announcements. * Direct marketing - including direct mail, leaflets, brochures, catalogues, circulars, inserts and facsimiles. * Screen promotions - including cinema commercial and advertisements in electronic media, such as computer games, video, CD-ROM and the Internet. From a marketing standpoint, Italy is the source of two very important market elements: a (significant) growth market and a dependable, though not too exciting "base" market (cash cow). Italy's domestic consumption of rice is very similar to the U.S., only better. Challenges There has been an overwhelming rise of viral marketing campaigns in last few years. Quick adoption of this method has made the field oversaturated. The overload of information today means it will be harder for viral campaigns to stand out from the pack. After customers were thus attracted, personal selling and display of merchandise were depended upon to make the sale. ADVERTISING AND THE FUTURE Today advertising has become a major form of selling. It not only supports other forms of selling but also frequently serves as the only selling tool used to move merchandise. August I will have a plan of how effective my advertising has been. This mean that in August I will be able to analyse the results and draw conclusions on what types of media to focus more on. This means in the future my advertising effectively will continuously increase. Advertising is called an 'above the line' promotional activity. Public relations: - this is a very important field in order to have a successful business you will need to form a good relation with certain types of customers and the public in general. In new product launches everything must go smoothly as there may be media coverage.